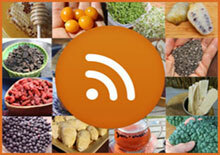 New Feed URL Coming Soon Hello RSS feed subscribers! :) Very soon (March 14, 2018) we will be transitioning over to a new website domain name (same site just new URL) and our blog feed URL will therefore be changing as well. If you'd like to continue receiving our Superfoods Blog feeds, you may need to resubscribe using the following URL: https://www.superfoodevolution.com/superfoods.xml - Our feed address, https://feeds.feedburner.com/SuperfoodsBlog, however, will remain the same.